RESTful services are stateless therefore each request needs to be authenticated individually. State in REST terminology means the state of the resource that the API manages, not session state. There maybe good reasons to build a stateful API but that is going against REST principles. It is important to realize that managing sessions is complex and difficult to do securely, as it is prone to replay and impersonation attacks. So what options do we have to secure RESTful services? This post looks into Basic Authentication, MAC (Message Authentication Code), Digital Signatures and OAuth. When looking at any security aspect, often a lot of terms get thrown around, which can be distracting and sometimes overwhelming. Therefore, before looking at the nitty-gritty of securing RESTful APIs it is worth getting some security jargon out of the way. Oversimplification Disclaimer - I have tried to explain the security basics in a general context, which might result in missing some of the technical nuances. Authentication - Validation of the sender’s identity so that receiver knows who they are talking to; e.g. client sends credentials (either in plaintext or encrypted) to the server that validates them. Authorization - Verification that the sender has access to a certain resource. Happens post authentication. Integrity - Ensuring message contents of a request haven’t changed in transit. Non-repudiation - Ensuring that the sender cannot deny having sent the message; e.g. your bank cannot deny having sent you a bank statement if it has a valid stamp of the bank on it and this could be proved to a third party. Confidentiality - No one can see the message contents in transit from sender to receiver. Ensure that the message can only be read by the intended recipient. Ensure that the message is from a known sender and it has not been modified in transit. The first problem can be solved using encryption. Encryption is used to achieve confidentiality and means only those with the corresponding secret key can read the message. However encryption alone does not guarantee integrity. The second problem can be solved using cryptography which often uses combination of encryption and hashing to achieve authenticity and integrity in addition to confidentiality. You share the same secret key between sender and receiver to encrypt and decrypt the message. You can trust the authenticity (from a trusted known sender) of the message, its confidentiality and integrity but non-repudiation cannot be guaranteed. Because the secret key could be shared amongst several participants, there is no single identity attached to the key, therefore the receiver knows it came from a source in possession of the key but doesn’t know which one. The risk of the key falling in the wrong hands is also higher because it needs to be securely shared amongst the participants, often over the internet. Other options include face-to-face meeting or use of a trusted courier but these can often be impractical. Higher the number of participants, higher is the exposure of the key. Different key is used between sender and receiver to encrypt and decrypt the message. This gets us beyond the shared key issue in symmetric key cryptography. In order to solve the first secure communication problem mentioned above, when encrypting, you use the receiver’s public key to write (encrypt) the message and the receiver uses their private key to read (decrypt) the message. This establishes confidentiality of the message. In order to solve the 2nd secure communication problem mentioned above, you use a digital signature. Digitally signing data is equivalent to a physical signature that can only be produced by the signing authority and verified by anyone who has visibility of the signing authority’s signature. 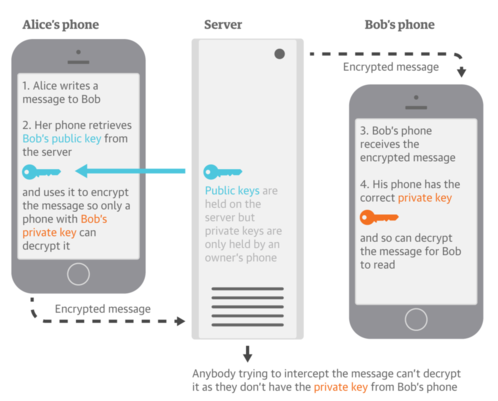 Signing uses public key encryption where the sender uses their private key to write message’s signature, and the receiver uses the sender’s public key to check if it’s really from the sender. It is a means of attaching identity to a key. It is discussed in further detail in the section below on message signing using digital signature. Having covered the security semantics, we can now look at the different techniques to secure RESTful APIs. These techniques are based on the security fundamentals discussed above. The most simple way to authenticate senders is to use HTTP basic authentication. Sender’s credentials (username and password) are base64-encoded and sent across the network unencrypted in an HTTP header. Credentials are sent over the wire and even though they are encoded, they are not encrypted and can easily be converted to plaintext. Credentials are sent repeatedly, for each request, which widens the attack window. The password may be stored permanently in the browser, if the user requests. The browser caches the password minimum for the length of the window / process, which can be silently used to make requests to the server e.g. in CSRF attacks. Using HTTPS can solve the first issue. Even then, the credentials are only protected until SSL/TLS termination. Any internal network routing, logging, etc. can still expose the plaintext credentials. In an enterprise, SSL/TLS termination often occurs much before the request reaches your API server. Does HTTPS protect the credentials in transit? Yes. Is that enough? Usually, No. Basic Authentication with HTTPS provides you confidentiality only for a window during which SSL/TLS is on. Basic Auth over HTTP exposes credentials in transit and does not guarantee integrity of the message. MAC on the other hand is used to send hashed version of credentials and the message using a secret key. It can be used to authenticate a message and verify its integrity. MAC is symmetric, i.e. 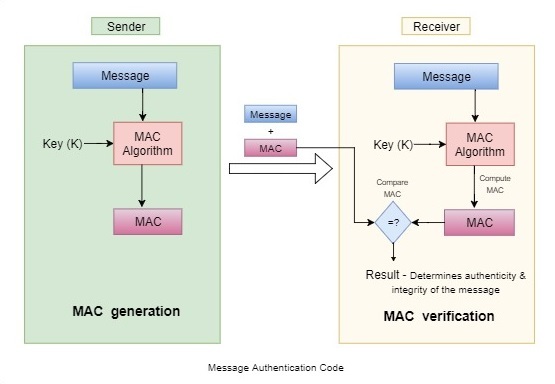 it uses the same key to produce a MAC value for a message and to verify the MAC value for the message. Hashing the same message repeatedly results in the same HMAC (hash). If the hash falls into the wrong hands, it can be used to make the same request at a later time. Therefore it is important to introduce entropy to the hash generation to prevent a replay attack. This is done by adding more data (timestamp and nonce) to the hash computation. The additional data (timestamp and nonce) is sent to the receiver for reconstructing the hash. The nonce is a number we only use once and is regenerated on each subsequent request, even if the request is for the same resource. The receiver reconstructs the hash with the nonce value and if it doesn’t match the received hash value, discards the message possibly because the hash has been previously used. This ensures each request is only valid once and only once. If the timestamp is not within a certain range (say 10 minutes) of the receiver’s time, then the receiver can discard the message as it is probably a replay of an earlier message. It is worth noting time-limited authentications can be problematic if the sender and receiver’s time is not synchronized. 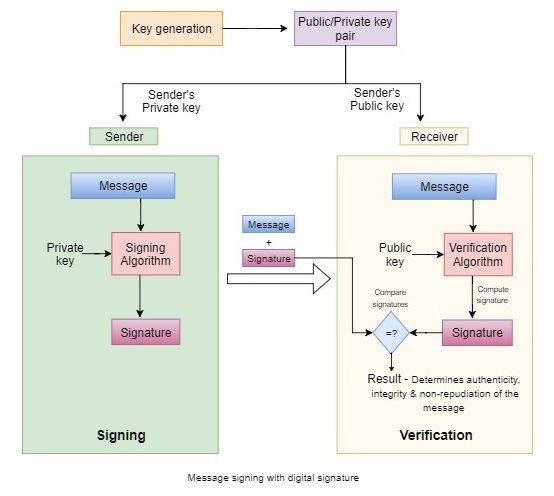 Digital signatures use asymmetric public key cryptography to establish authenticity (message sent by a known sender), integrity (message wasn’t tampered with) and non-repudiation (message sent by the sender cannot be denied). When signing, the sender uses their private key to write message’s signature, and the receiver uses the sender’s public key to check if it’s really from the sender. A timestamp and nonce are used to generate the signature, to prevent reuse against replay attacks. A service (when acting as a receiver) has a list of public keys for all other services that want to talk to it and provides its public key (when acting as a sender) to other services that it wants to talk to. Digital signatures can be safely used without SSL (although SSL is still recommended if the data transferred is sensitive). However, this level of security comes with a price: generating and validating signatures can be a complex process. outsource the authorization server as a service that the user trusts, such as a social identity provider like facebook. This allows you to focus on building and scaling your APIs (resource server) independent of authorization. However the authorization server and the API do not necessarily have to be on different servers. 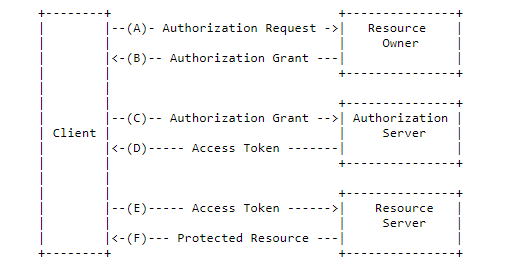 OAuth 2 has multiple flows called grant types for obtaining an access token. Deciding which grants to implement depends on the type of client the end user will be using, and the experience you want for your users. In essence each flow involves obtaining authorization to get an access token and using the access token to access protected resources. An access token is a JSON Web Token (JWT) encoded in base64URL format that contains a header, payload, and signature. A resource server (API) can validate the access token and can authorize the client (application) to access particular resources based on the scopes and claims in the access token. The authorization server provides /.well-known/openid-configuration service discovery endpoint for clients to get information about interacting with the authorization server. OAuth is for authorization but lot of applications require to know the users identity too. OpenID Connect adds authentication to OAuth. It is a REST-like identity layer on top of OAuth 2 that allows clients to verify the identity of the end-user, as well as to obtain basic profile information about the end-user. curl https://api.example.com/profile -H "Authorization: Bearer XXXXXXXXXXX"
The tradeoff is all requests must be made over HTTPS. This provides a good balance between ease of use of APIs and good security practices. Before deciding on an API security approach, it is important to understand what are you going to secure and what is the sensitivity of the data being managed? APIs handling things like personal data, medical health records or financial data will need a different security approach than an API handling, say traffic updates. It is also worth defining the scope of your API security. Securing network and server infrastructure for things like intrusion, eves dropping via packet sniffing and physical security often lie outside the scope of API security. Opting for a particular technique may depend on specific security requirements of your application because each technique covers different aspects of security. For example basic authentication without HTTPS can provide authenticity but no integrity or confidentiality. MACs may be sufficient for internal APIs (non public facing) serving a few web applications. For highly sensitive data, digital signatures maybe a necessity, but if you are looking for flexibility and performance at scale OAuth 2 Bearer tokens maybe the way to go.